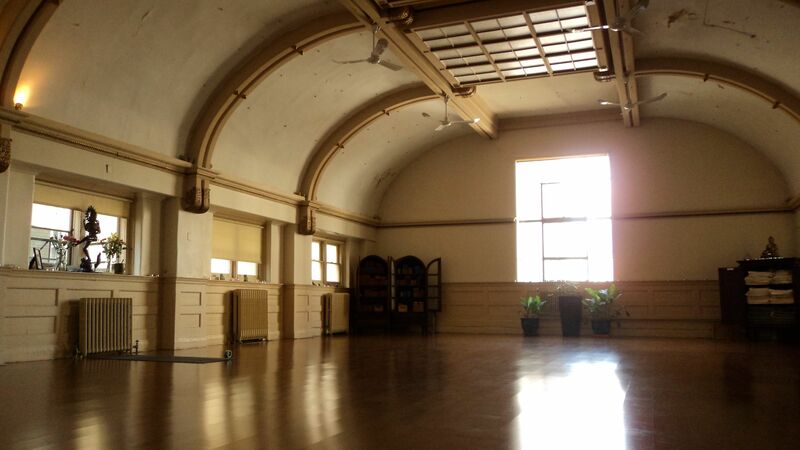 This room – Studio 1, “the Big Room” at The Yoga Sanctuary College – is rich in Bhav. The polished floors and arching ceiling are infusued with the blood, sweat, tears, practice and prayers of thousands of yogis since sisters Cynthia Funk and Kimberley Sopinka opened its doors over 16 years ago. Cynthia told me stories of preparing the room, how the men who laid the original floors (including Cathy Keenan’s father) continuously chanted Buddhist mantras during their work, filling the space with blessings.This week, the girls announced that TYS College will be moving this fall, due to major renovations at 2 College St. TYS College will move across the street to 1 Wood St, and regularly scheduled classes will continue. 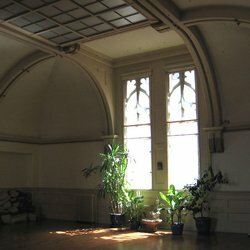 I will never forget the very first sun salutation I taught in this room. Hosting events with my own teachers Lama Marut and Sharon Gannon. Chanting and rose petals during my teacher training. Partner yoga with my husband, when he did his first ever headstand. Sweet kirtan with Dave Stringer. The room is full of the presence of so many of my teachers. All the wonderful TYS faculty. All my fellow YTTers in my teacher training, who shared their questions and insights and bodies and let me clumsily manhandle them in adjustments. But none more than those who have posed as “students” in the classes I’ve taught there. We’ve got one more Moon Yoga class at 2 College St on Mon Oct 26 at 8:45pm – I hope you’ll come and enjoy the space while we’re still there. Starting in November, we have a beautiful opportunity to take our Bhav with us and infuse a new home with all our sincere practice and good intentions. Please see below for a message from TYS co-owners Cynthia and Kimberley on the move, and stay tuned here for more updates. Join me and the rest of the TYS family at the beginning of a great adventure…. We are happy to announce that our College St. studio is moving to a new space. 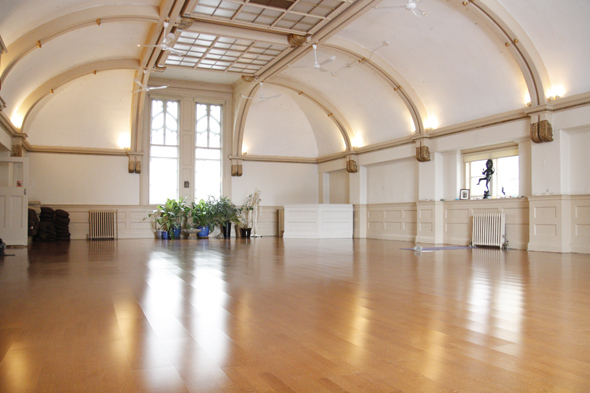 It has been our pleasure to have built our beautiful yoga community in our current 2 College St. location. It has become a second home for many of you, as well as some of our teachers and staff, and we will cherish the memories that we have created together in this unique architectural gem over the past 16 years. 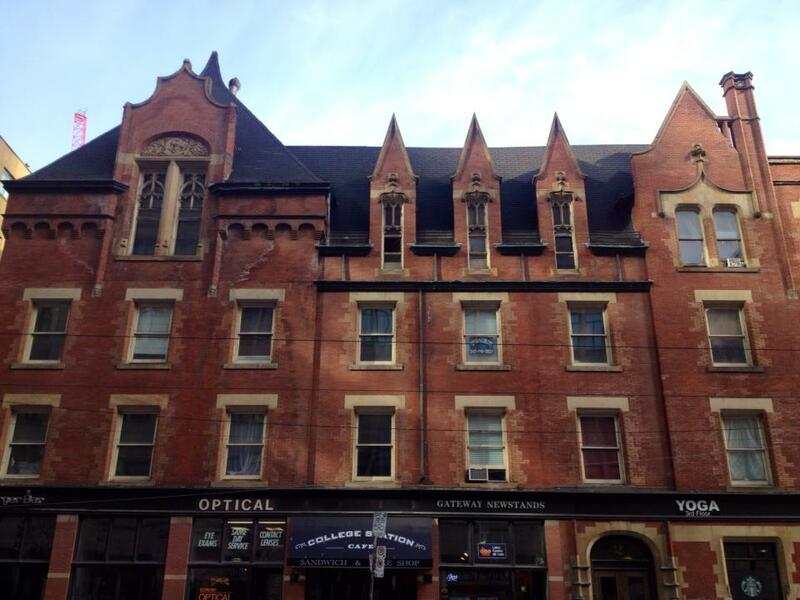 You may ask why?… This past summer we were informed of imminent renovations to 2 College St. These will be rather extensive and we will therefore need to vacate for the work to be done. Our new location is going to be 1 Wood Street. The entrance to the new location is on the south side of Wood St. (Wood and Yonge) across from the Second Cup at the Marriott. Our new studio space has high ceilings in both practice studios, and better yet, dedicated heating and air conditioning! We have exciting plans for this location and look forward to welcoming you all there. We have a tentative move-in date at Wood St for the first week of November. You will be able to enjoy the same great classes you have come to know and love in our new space. Our current schedule will remain the same.